As we are standing around the Southernmost Marker, we sometimes cast our eyes to the skies and think about all the folks across America that might be a bit chilly at that moment? When the country are deep in the midst of winter you can find us standing around this strange multi-coloured barrel shaped icon. It’s a sunshine thing you know. 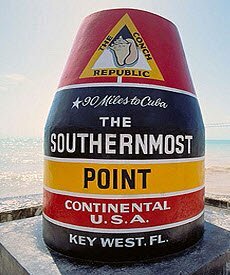 The Southernmost marker, which for some unknown reason was constructed resemble a buoy, sits proudly at the most southern tip of Key West, so it gets it fair share of delightful weather. And also a fair share of camera snapping tourists too. Just look for the traffic jam at the Atlantic end of Whitehead Street and you'll see the giant, red, white, green and yellow marker that designates the southernmost point of the United States of America. This place is a tourist magnet, and all around it (even blocking the traffic turning left onto South Street) you will see an never ending flow of Key West visitors trying to take the perfect picture. Is it just a tacky, touristy thing or does it have more depth? Well, the the bit that seems to delight the tourists is the bit about Cuba. They seem to take great delight in fact that the country is less than ninety miles away. 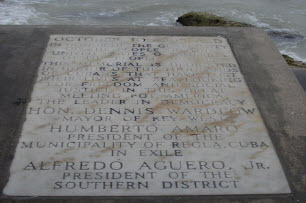 But sitting to the right, the thing that I find most moving is the plaque that commemorates the incredibly brave Cubans who tragically drowned trying to find a new life in America, "The Leader In Democracy." It's really worth stopping for a moment and reflecting how lucky most of us are. All around the Monument for block after block, are numerous other "Southernmosts" and one for sure in this part of town everywhere wants to say it is the southernmost something. You will find the southernmost hotel,the southernmost house, Southernmost restaurant etc.....I think you get the idea. Right at the monuments very top the logo of The Conch Republic is painted. A few years ago Key West, fancied to emphasize its reputation as a part of America all on its own. 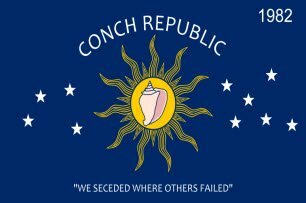 A fun, sunshine seeking, relaxed bit of paradise, and with this desire sought to declare itself as The Conch Republic. And now every April, a ten-day party is held to celebrate the event. However, what ever the significance of the marker, over the last few years other parts of the United States, for example Hawaii have claimed to be further south. And quite honestly when all you have to do is take a glance at a map, you cannot deny they have a point. Others have stated that the Southernmost Marker is NOT at mile marker 0 on US 1. 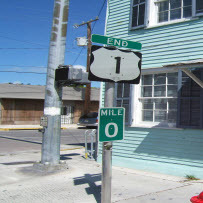 People Love To Steal This Mile Marker In Key West. The sign that states "END US1" is a zero on a green mile marker. This is seen as a must have, and many over the years have been taken without permission. The sign is to be found at a simple crossroads, which is very low key ending for any road of note. More amazing, this simple green sign signifies the finishing point of the Overseas Highway (US1), which is still about a mile away from the actual southernmost marker. You might be surprised to know that although this place is celebrated with a concrete marker, there are much further places south funnily enough. Many points such as Fort Zachary Taylor and Harry Truman Annex are much further south, but you cannot drive down to them, like the marker here. Whoever becomes of the true claimants of the title “The Southernmost point of America” one thing can not be disputed. The marker makes a very nice photograph opportunity. Especially one to send back to the relatives scraping the ice of their cars.